If you visited here on Sunday, you saw an over-the-top fun fold card that I created with the Ready for Christmas Bundle. If you missed it, you can see it HERE. Today, I’d like to share a much simpler card, using the same bundle. With only a few die cuts, this card would be much more manageable to mass produce! The card base is Crumb Cake cardstock which measures 8 1/2″ x 5 1/2″, scored and folded at 4 1/4″. The next layer is 4″ x 5 1/4″ Real Red cardstock, attached with the Liquid Glue. Next, take a 3 3/4″ x 5″ piece of Whisper White cardstock, ink the sentiment from the Ready for Christmas stamp set in Real Red ink, and stamp on the upper right hand corner. Then with the Brick Wall Embossing Folder, run it through the Big Shot. Stamp the tree image in Garden Green ink onto Pear Pizzazz cardstock. Then use the Christmas Staircase thinlits to die cut the tree, and the staircase from Crumb Cake cardstock. Use the star and bauble dies with Dazzling Diamonds Glimmer Paper to die cut those shapes. Attach them to the tree with Mini Glue Dots. Once you have your tree together, first attach the staircase to the card base with Dimensionals, then add the tree, also with Dimensionals. Like I said – this version is much quicker than the one I shared on Sunday! Order the supplies I used by clicking on the images below. Or, if you want to browse through my online store, click on my signature 🙂 If you have any questions about putting this card together, either leave a comment on this post, or click the ’email Deb’ button on the right. I’m always happy to hear from you! If you’d like to just leave a comment – I’m always happy to read them, too! This is such a sweet card, Deborah! I loved the fancier one, too – but this does look a little more doable for those of us who like fast and easy! Another great card, Deborah. Don’t make me get that set! You are such an enabler! 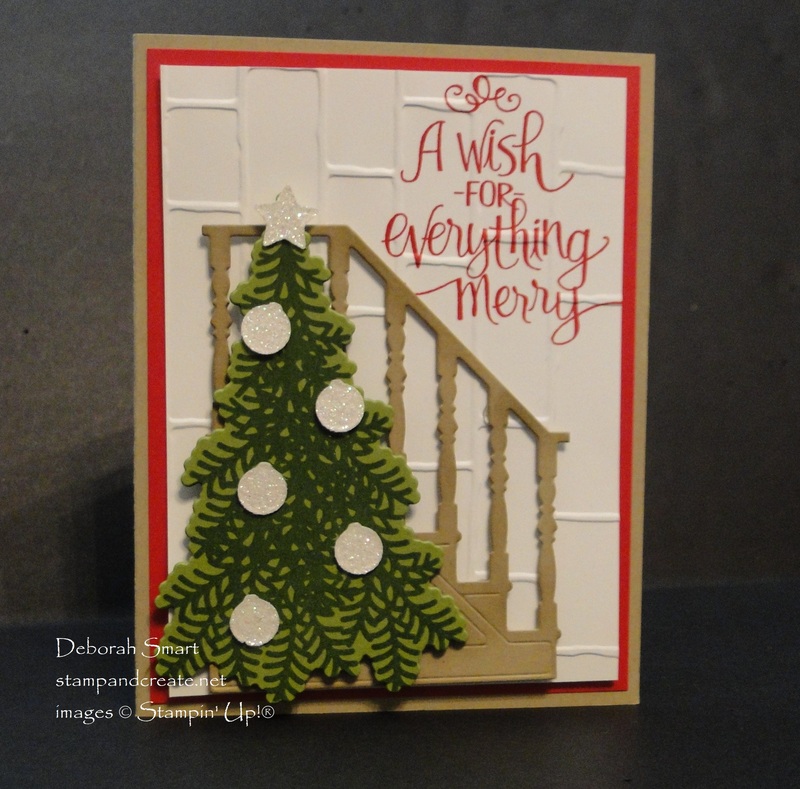 Deborah, your card is beautiful! I love the staircase!